Uroczysko roadside cafe in Sitaniec is drawing people its characteristic architecture and history of location. First mentions about roadside cafe in Sitaniec near Zamosc becomes from XVI century when relatives of the Zamosc city administrator have built roadside cafe on the hill surrounded by the forest. In that times roadside cafe have given its quests opportunity to relax, take a brake and strenght for further voyage. Quests in roadside cafe in Sitaniec were magnates, counts, dignitaries and what’s the most important lords and kings. For example in 1634 Tomasz Zamoyski went to Sitaniec to welcome with honors king Wladyslaw IV. Nowadays, we organise family events and business conferences there. Knowing this place famous and knighthood tradition we are always happy to welcome our quests. Here they could relax and try traditional Polish and European dishes. Inside Uroczysko roadside cafe there are air-conditioned restaurant and conference halls for 150 people. We co-operate with the best bands and professional cameraman. 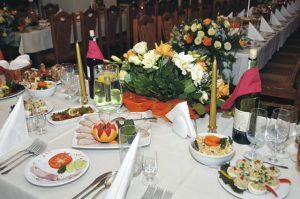 Party in Uroczysko gives you unforgettable experiences. Beside that we organise tours and sightseeings. There’s a parking for 20 cars here. We invite to watch photo gallery of Uroczysko event house. If you want to organise event like wedding or any different event please contact with us and we will show you our offer. We specialise in organisation of events like weddings, christenings, holy communions, banquets, dinners, conferences and carnavals and New Year’s Eve.